The lighting of a Unity Candle as part of your wedding ceremony is increasing in popularity yet is a relatively recent addition to the traditional wedding ceremony. The ceremony uses two smaller pillar candles with a large pillar candle (called the "unity candle") in the centre. A Unity Candle is usually used in one of two ways; to symbolise the joining together of the two families, and their love for the wedding couple, into one united family that loves the newlyweds, or, to symbolise the union of two individuals, becoming one in commitment. At the beginning of the wedding ceremony, a representative from each family (usually the mothers of the bride and groom) light the two smaller candles. Later in the ceremony, usually after the formal vows, the bride and groom use the two smaller candles to light the large pillar (unity) candle together. The candles are almost always white and the lighting ceremony may be accompanied by special music, an explanation of the symbolism, or just some period of mutual gazing by the happy couple. It is becoming a popular custom for the couple to save the unity candle and relight it on anniversaries. 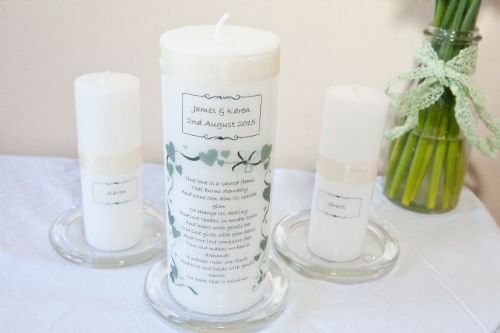 The Unity Candle Collection also makes a wonderful and very personal candle wedding gift to the happy couple. It is personalised with your message and verse and comes in its’ own gift box.